White House Dismisses Constitutional Challenge In Debt Ceiling Saga : It's All Politics White House spokesman Jay Carney put an end to intense speculation Thursday about whether President Obama would do an end run around Congress with one simple line: "This administration does not believe the 14th Amendment gives the president the power to ignore the debt ceiling — period." 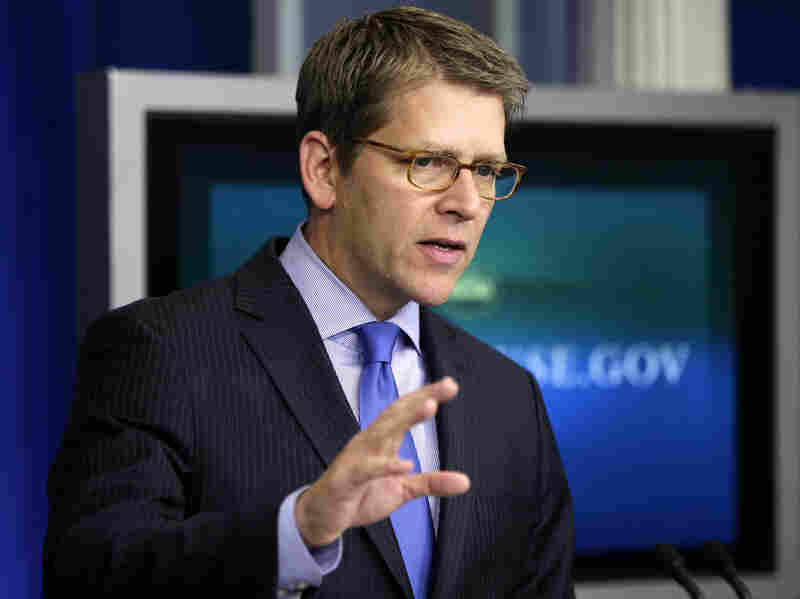 White House spokesman Jay Carney briefs reporters Thursday at the White House. "This administration does not believe the 14th Amendment gives the president the power to ignore the debt ceiling — period," he said. Some Democrats had been urging Obama to unilaterally raise the debt limit — a bold move that would take away Republican leverage in the ongoing negotiations over taxes and spending. While the debt ceiling is not technically part of the so-called fiscal cliff, a deal last year over raising the ceiling gave birth to the looming across-the-board budget cuts scheduled to begin in Jan. 2. And because the country is expected to hit its current $16.394 trillion debt ceiling early in the new year — precipitating the need for new congressional action to raise it again — it has become entangled in the broader talks. At a Politico breakfast last year, Treasury Secretary Tim Geithner, no fan of playing chicken with the nation's debt, was inspired to pull out his copy of the Constitution to make a case for an executive branch power grab. "Can I read you the 14th Amendment?" Geithner asked, before reading one small part of the post-Civil War amendment that most famously granted citizenship to former slaves. Here's what Geithner read (with an aside of his own): "The validity of the public debt of the United States, authorized by law, including debts incurred for payments of pension and bounties for services in suppressing insurrection or rebellion — this is the important thing — shall not be questioned." But law professors say advocates for the idea of bypassing Congress are misreading the Constitution. "I have never seen a remotely persuasive argument that the president is entitled to borrow money that the Congress hasn't authorized," says Michael McConnell, a retired federal judge who now teaches at Stanford. McConnell says the important language in the 14th Amendment as it pertains to the debt ceiling is not the part that says the debt shall not be questioned — but instead the part that reads "authorized by law." The 14th Amendment, McConnell says, "does not authorize the president to do anything. And it certainly doesn't authorize him to violate the clear constitutional provision that requires congressional authorization for borrowing." Legal experts say the other relevant statute on the books dates to 1917, when Congress restricted the level of federal debt, setting the so-called debt ceiling. "The debt ceiling has been around since the early 20th century," says Cornell law professor Michael Dorf. "It's only very recently that Congress has tried to use it as serious leverage." And if the standoff continues, Dorf says, Obama will have a big problem on his hands, since he can't raise taxes, borrow or spend on his own. "It's a little like a parent telling a child, 'You have to buy some stuff at the store, and here's how much money you can spend,' but not giving the child enough money and saying, 'But you got to buy all those things.' And then forbidding the kid from borrowing enough money to make up the difference," he says. That challenge led Dorf and George Washington University professor Neil Buchanan to a rather unusual conclusion, in a new article they published in the Columbia Law Review: Given a choice between only unconstitutional options, the president should choose the "least unconstitutional" option. Which, Dorf says, means the White House could raise the debt limit on its own and issue Treasury bonds to raise money. That solution, beyond being against the law, has another problem. The markets don't like uncertainty. And anyone who wants to buy those bonds might demand huge interest payments to compensate for the legal risk involved. There's one more complication, courtesy of Steve Bradbury, a Washington lawyer who formerly headed up the Office of Legal Counsel at the Justice Department for President George W. Bush. Bradbury says the Antideficiency Act makes it clear the White House can't obligate the U.S. government to pay money without an appropriation from Congress or other direction, in the form of a law. "Executive officers who spend money when it's not authorized or incur debt that hasn't been authorized by statute are actually violating federal law," Bradbury says. "And in fact, although there have not been prosecutions under that statute, it is a criminal statute," exposing government officials to inspector general and General Accounting Office investigations, if nothing else. Not all is lost, says Cornell's Dorf. "It really is a great puzzle and I should say as a professor of constitutional law, I'm grateful to Congress and the president for creating this really tricky situation — although as a citizen I'm of course a little concerned."